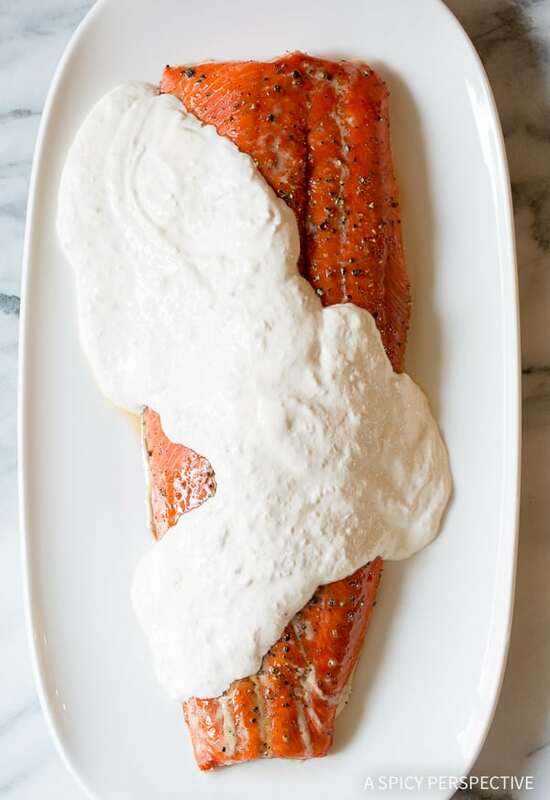 A true holiday classic, Smoky Oven Baked Salmon with Horseradish Sauce, that can be served warm for dinner or cold as an appetizer. One of the most memorable parties I ever hosted, was my first grownup Christmas party. It was my first Christmas as a newlywed, as a working girl with a job that required a degree, and as a homeowner. I felt very very mature. Our little 1930’s bungalow was decorated with brand spanking new Christmas decorations, and I had dog-eared hoards of recipes in my favorite cookbooks, trying to come up with the perfect party menu. Finally I settled on serving various heavy h’ordeuvres, some that could be made ahead, and some that would need to be prepared right before the party. Lt. Dan was in charge of cocktails, and I would do all the cooking myself, in my new kitchen. The problem was, I’d never made that many dishes all by myself. 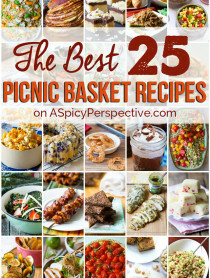 I’d always had my mom, or several friends to cook with, when hosting a get-together. The day of the party I felt completely overwhelmed. Fortunately for me, an older wiser friend had anticipated this, and brought me a traditional Smoked Salmon Recipe with Creamy Horseradish Sauce to serve at the party. 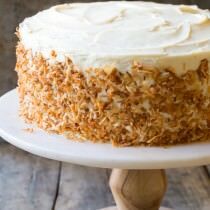 She brought it over several hours before the party started and told me to cross a couple recipes off my list. The salmon would be more than enough to fill in the gaps. At first, I was hesitant… Change my plans last minute? Yet, I gave in to her kind advice and generous gift. The food was a hit. Our friends were in rare form that night with jokes and stories. Plus, I had time to shower and have a glass of wine beforehand, due to my friend’s salmon recipe. 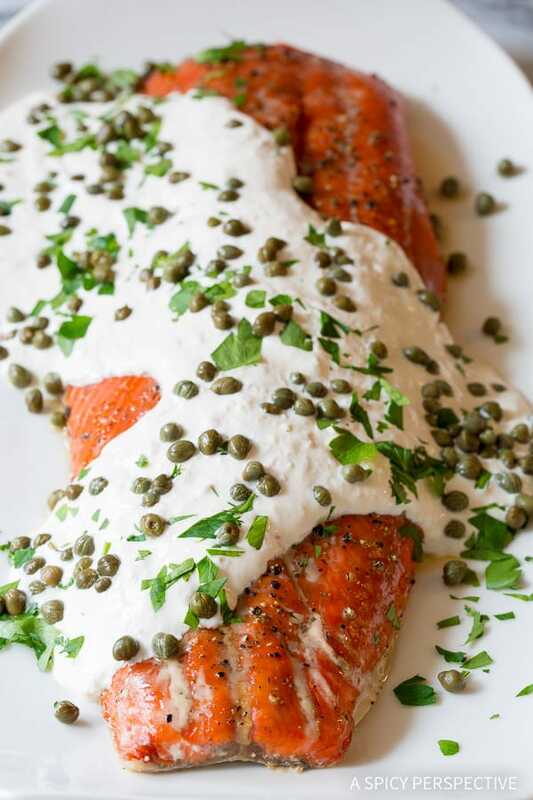 So, today I’m sharing my indoors rendition, a 10-Ingredient Smoky Baked Salmon Recipe with Horseradish Sauce, that can be made in less than 30 minutes. 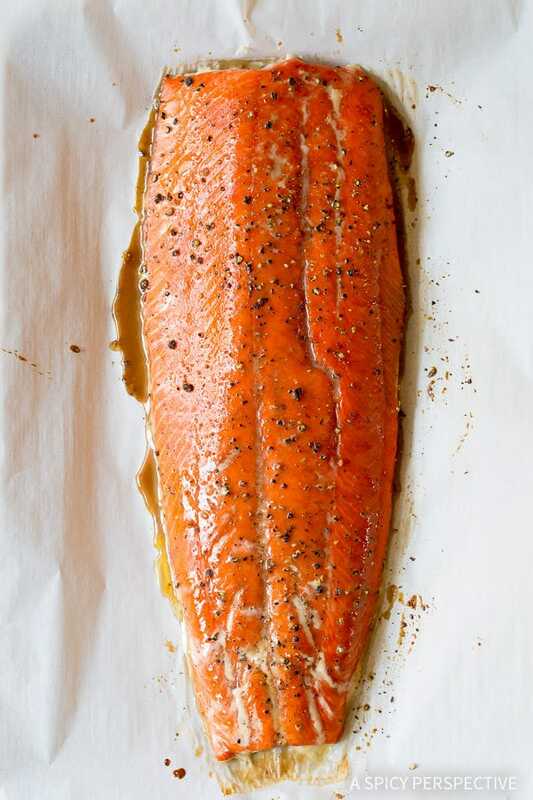 To make this marvelous cheater version, place a whole wild salmon fillet on a baking sheet and massage it with brown sugar and liquid smoke. 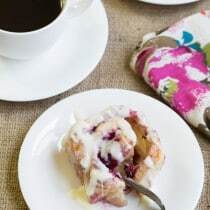 While it’s baking, whisk together a quick sauce of shaved shallot, horseradish, sour cream, and a touch of dijon mustard. 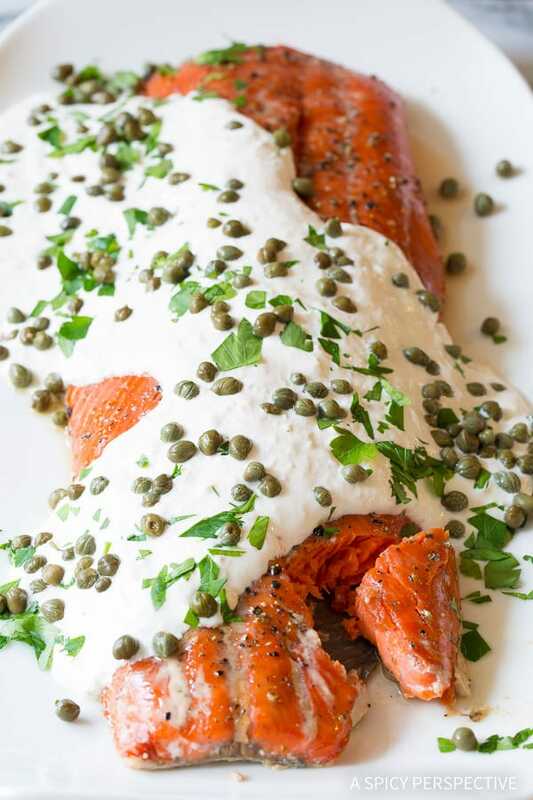 The beauty of this Smoky Baked Salmon Recipe with Creamy Horseradish Sauce is that is tastes fabulous warm or cold. You could even make it a couple days ahead and keep it in the fridge. Then pour the sauce over the top right before serving! 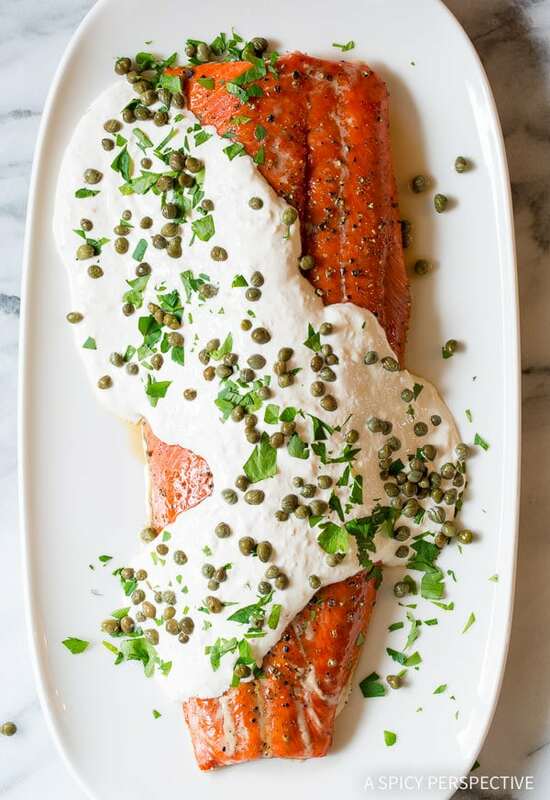 Top the Smoky Baked Salmon Recipe with Creamy Horseradish Sauce, salty capers, and some fresh parsley and you have a holiday hit your guests will ask for year after year. 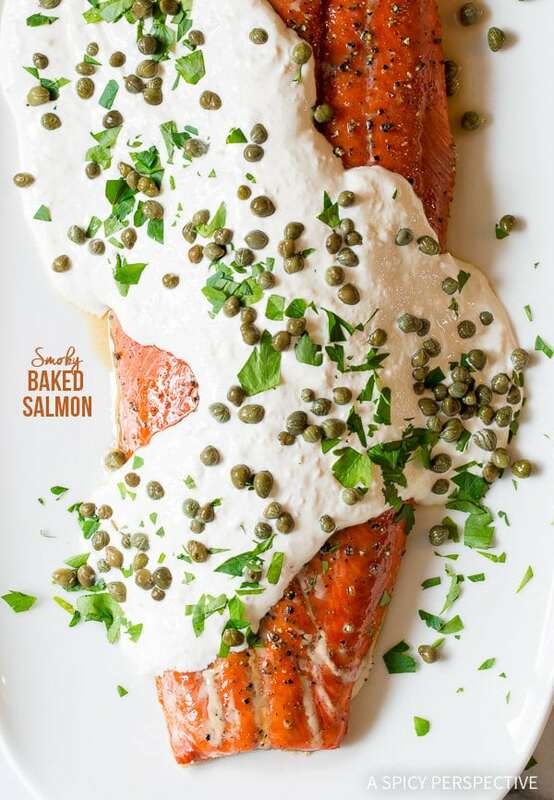 Easy Smoky Oven Baked Salmon with Horseradish Sauce. 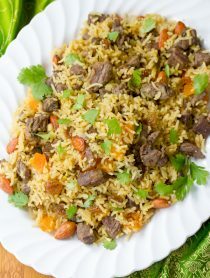 A fabulous holiday dish that can be served warm for dinner, or cold as a party appetizer! Meanwhile, shave the shallot with a large grater. 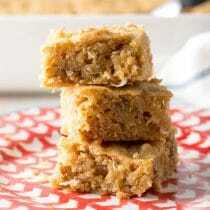 In a mixing bowl, mix the sour cream, milk, shallot, mustard, and horseradish. Salt and pepper to taste and set aside. Once the salmon is out of the oven, allow it to cool for at least 5 minutes. 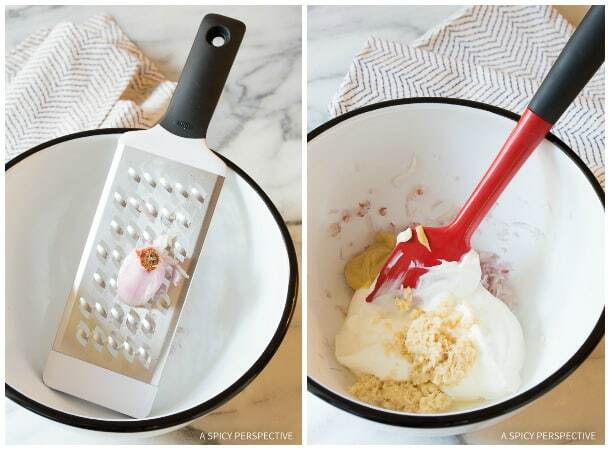 Then carefully move it to a platter using two spatulas. Pour the horseradish sauce over the top and garnish with chopped parsley and capers. This dish is great warm, but Lt. Dan likes it even better cold. 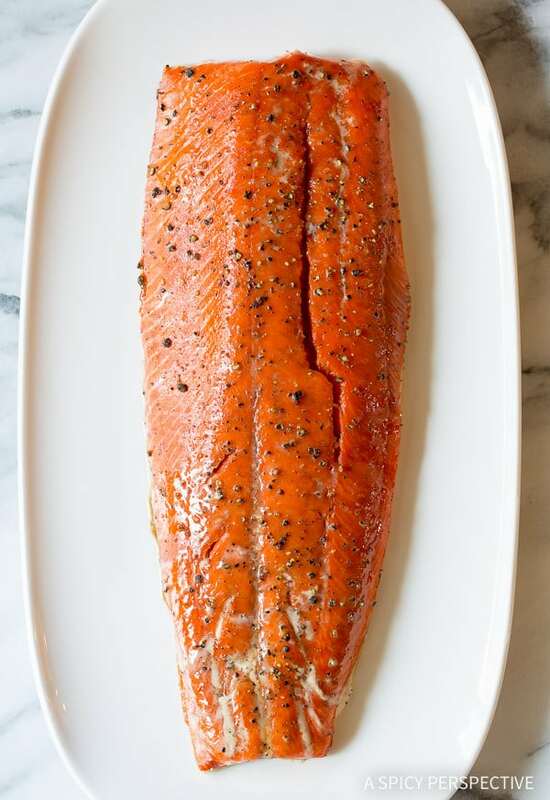 Make the salmon ahead and chill. Then top with the horseradish sauce and capers right before serving. 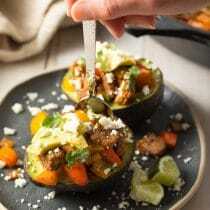 Makes 6 entree portions or 12 appetizer portions. Grilled salmon with smoked canola is full of flavor and very attractive. The food is very nutritious. The formula is very specific. You might want to include the components for the horseradish sauce in the ingredients list. I didn’t notice that they were missing until I got to the grocery store and realized I wasn’t sure what I needed to make the sauce. As for the dish itself—Wow! This will be my go-to salmon recipe from now on. Beautiful to look at, excellent to taste! Hello! Looks delicious and I can’t wait to try. Don’t see any horseradish amount listed in the ingredients. The posted recipe does not include all ingredients. It’s missing qty of the mustard, shallot & horseradish for the sauce. This is wonderful. Dinner party worthy to be sure. I made the sauce several hours ahead and think it achieved a good subtlety. We had scalloped potatoes with the salmon and used the sauce on it too. I would like to use your friend’s grill method. How did it differ? Cook it over a very low heat charcoal grill with soaked hickory wood for flavor. 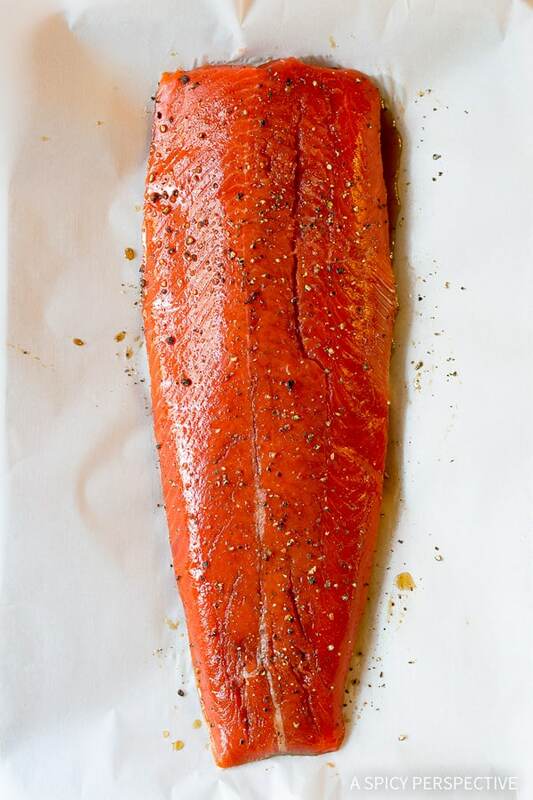 The salmon will take 40-60 if the grill is low enough… But that provides a great smoky taste! That sauce looks sooooooo tempting!! 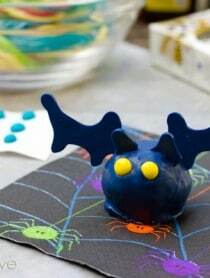 I don’t know if I could decide whether to serve this as a main or as a stunning appetizer. Looks amazing either way! But then, anything with horsey sauce is a winner in my book. That salmon! And THAT SAUCE!! We always try to do something different for the holidays, and for being in Seattle, salmon is always our first choice!! I have never tried to comment before, hope I do this correctly. I have always wanted to try salmon, however my husband is very reluctant to. I know that he does NOT like horseradish, is there something else you could recommend for a topping, sauce or dip? Hi Peggy! I have a couple other baked salmon recipes that might be a better fit if your husband doesn’t like horseradish. 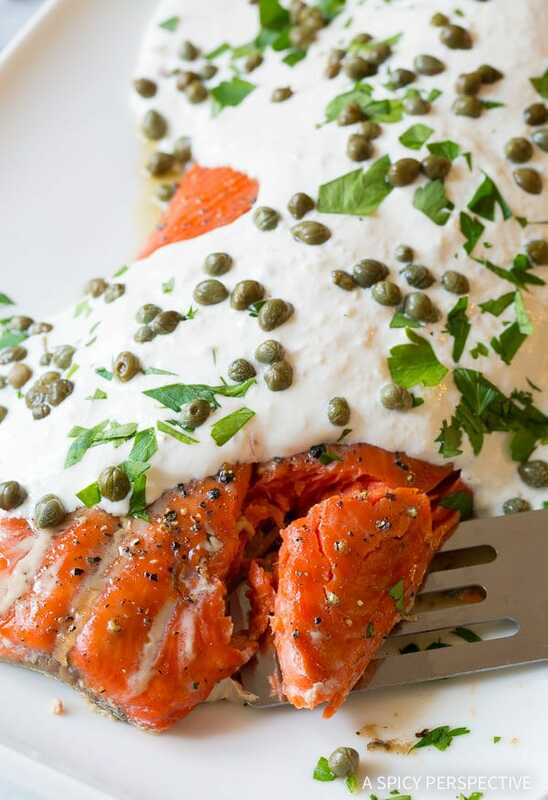 this salmon recipe looks ah-mazing! What a nice way of doing salmon! Josh would love this one! This is the kind of dish I’d love to be served this holiday season! And by that I mean just put the whole platter in front me and let me go to town!